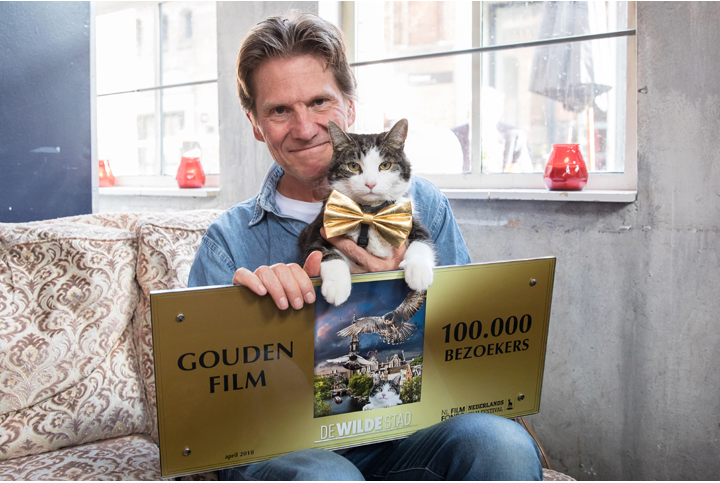 The cinema film De Wilde Stad has achieved the Golden Film status and attracted more than 100,000 visitors to the cinema since the release of 1 March. The makers of De Nieuwe Wildernis and Holland, Nature in the Delta, show the urban nature with De Wilde Stad from the perspective of the many unnoticed wild animals and plants. The Golden Film has been handed over to film director Abatutu and director Mark Verkerk by the Netherlands Film Fund and the Netherlands Film Festival. The Wilde Stad is the third film this year that achieves the Golden Film status. The Wilde Stad is a cinema film that connects scripted scenes with documentary images of urban nature. It is a city film that shows the dynamism, speed, power, beauty and humor of nature in an urban environment with plot twists. It is a story full of encounters between animals and people, starring the famous film cat Abatutu. The cat is a purebred city dweller. He loves the city, knows where to find a place and knows its inhabitants, both animals and people. He sees things that go unnoticed for many people, simply because they are too busy, with themselves or with their mobile phone and he gives his comments. Actor Martijn Fischer takes care of the voice-over. Record label Top Notch produced the music with songs by, among others, Sef, Thijs Boontjes and Manke Nelis.